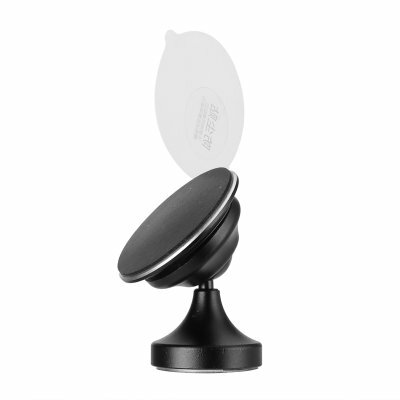 Successfully Added Magic Cell Phone Holder - 360-Degree Rotation, Nano-Micro-Suction Technology, Easy To Use And Clean, Suitable For All Phones to your Shopping Cart. This magic cell phone holder for in your car can be used to easily and efficiently attach your smartphone to any smooth surface – ensuring it will always be within reach while driving your car. Simply stick this smartphone holder to your car dashboard or window, and this car accessory will conveniently keep your smartphone in place without the need of any further difficult installation processes. For those of you that like to use their smartphone for navigation purposes while driving, or for people that often engage in hands-free phone calls in the car, this magic cell phone holder is the ultimate accessory that is guaranteed to bring along great in-car convenience. Featuring a 360-degree rotatable base, you will be able to turn around your phone and manually adjust the viewing angle without needing to detach it from your dashboard. Whether you use it for GPS purposes or your passenger uses it to watch a movie while waiting to reach the upcoming destination – simply adjust the angle and no matter where in the car you are sitting, you’ll always be able to enjoy a great view. This state of the art phone holder furthermore features a unique micro-suction technology that works without the use of any magnets – guaranteeing safe usage without needing to fear of damaging your smartphone. Thanks to its ultra-strong suction, this compact phone holder is capable of holding any size smartphone and can be used unlimited times without losing any strength. With its simple design, all you need to do is press this smartphone holder to any smooth surface in your car and you’ll be all set to attach your cell phone. Whether you use it to attach your phone to your dashboard for navigation purposes, or to allow your passengers to watch a movie on their smartphone while in the car – with this amazing smartphone accessory your opinions will be limitless. Its highly compact and lightweight design additionally lets you to simply detach it and carry it along to be used in any other car – bringing along high efficiency. The Magic Smartphone Holder comes with a 12 months warranty, brought to you by the leader in electronic devices as well as wholesale electronic gadgets..